First of all, let me assure you that I—like most Ukrainians—fully support your current activities in my country. All of us want to see Ukraine once again become a part of a strong and mighty Soviet Union. We desperately need Russia to rescue us from all those gays, progressive political ideas, and people who insist on openly speaking their minds under the pretext of this “free speech” nonsense. You have demonstrated an uncanny ability to effectively deal with all three, so your leadership is required here. The media insist that Viktor Yanukovych was ousted for being too corrupt and dictatorial, but you and I both know the truth: He was simply not corrupt and dictatorial enough. No, we want you, Mr. Putin! Having said that, I am deeply concerned about the efficacy of your current propaganda efforts and political maneuvering. If Russia is to finally annex Ukraine, you need to do much better than that. Please allow me to humbly point out some weaknesses in your overall strategy, so that you may address them. I am no fool. I acknowledge the need for a full-blown disinformation campaign aimed at Russian citizens, in order to gain their support. What else are you going to do—tell them the truth?! Ha, imagine? I admire how you have cleverly chosen to paint Ukraine as a country where Russian-speaking citizens are persecuted and marginalized. Where militant nationalists and fascists are shooting and killing ethnic Russians left and right. This is a wise and necessary strategy. As a son of a Russian mother and a Jewish father (and a proud speaker of Russian) I can only support you spreading such lie…ahem…stories, if only to take those “pure Ukrainians” down a peg. Even zombies get tired every now and then. A number of sites have begun to crop up, exposing these and other…inconsistencies. One of these sites is www.stopfake.org. People behind it claim to be journalists. They seem to mistakenly assume that journalism involves disseminating facts, while you, Mr. Putin, know better than anyone that true journalism is about creating a dependable and efficient channel for government propaganda. Why are you hesitating to shut down their site? Or why don’t you at least help create a counter-site, something like http://www.support-necessary-disinformation-in-pursuit-of-greater-good.ru? Frankly—if I may—this is laughable. Surely Russia can afford more and better actors to pose as pro-Russian supporters. Hell, if you bought me a summer house in Sochi, I’d consider signing up. I’m sure I could play a much more convincing dead body; I’ve taken drama classes before. More disturbingly, however, an increasing number of people have begun to speak up against what’s happening. 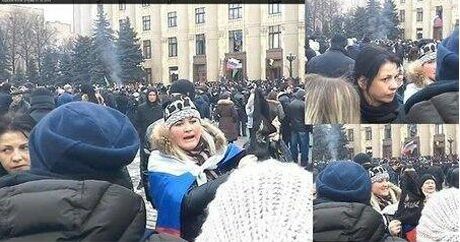 Worst of all, they do so while calmly appealing to rational thinking and calling for unity among all people of Ukraine, regardless of ethnicity . The nerve of them! Take this monster—who happens to be the mayor of Lviv—spreading his vile, poisonous message of peace among all Ukrainians and a stable, truly democratic and tolerant country. Look at how well-spoken and well-reasoned he is. It sickens me! Or how about this man, Dr. Komarovsky, a pediatrician based in Ukraine, yet popular among Russian parents? Look at him, urging everyone to exercise common sense and search for unbiased sources of information instead of consuming your beautiful, well-crafted propaganda! Mr. Putin, comrade, I understand that your reach within Ukraine is somewhat limited, and that’s why you are yet unable to stop these people from speaking so freely. But how do you excuse similar dissenting voices coming from within Russia itself? Comedians, celebrities, and others are speaking out against your actions, calling for the people of our two historically friendly countries to stay united against war and propaganda?! What about countless posts on social media, debunking your claims and speaking out against your polices? How are you letting this madness happen? Listen, I realize that things were different in the old days. Propaganda is much easier to spread when there’s a single TV channel that is fully controlled by the government. The Internet is making your job very difficult, I admit. But there are ways. Other countries have been able to prevent their citizens from accessing Internet sites, at will. Why can’t you? It’s almost as if you’re not very committed to this course of action. Finally, on the subject of Russian troops moving into Crimea. Why aren’t they wearing identifying insignia, designating them as such? It would make the process so much smoother. Surely if Russian troops openly crossed into Ukraine they’d be welcomed as heroes and liberators! It’s not like moving your army into a neighbouring country is against international laws, or something. Why not just have the Russian army raise the Russian flag and march victoriously into Ukraine, letting our citizens—tired of fascists and ultra-nationalists—march with Russia to rebuild the USSR of old?! Instead you are sending mixed signals and creating all sorts of confusion. What if somebody mistakes the noble Russian troops for some sort of foreign insurgents, illegally invading Ukraine? That could lead to all sorts of hilarious misunderstandings, no? Comrade Putin, I have every confidence that you will heed my above concerns. Crack down on the voices of reason. Put out more effective propaganda (after all, you put out what you Putin—ha, ha, I kid). Make your stance clear, and let Ukraine rally behind you as the true leader of a glorious and undefeated Soviet Union. On a more selfish note, I hope that—once Ukraine is absorbed into your empire—you will spare a moment to do me a personal favor. You see, I currently reside in the country of Denmark. There are thousands of us ethnic Russians and Russian speakers here in the country. Every single day we are forced to speak Danish (or at least English) to the rest of the people. More than that, the Danish government stubbornly refuses to recognize Russian as one of the official languages, thereby continuing to marginalize and oppress us. Please, comrade Putin, if you have any troops to spare, make them invade Denmark and protect your Russian people. We need you now more than ever! Long live the Red Army. Glory to the Soviet Union. I enjoyed reading your satirical take on this volatile situation, as well as the comments from your readers. I’m glad you did. I only hope that things don’t evolve for the worse. I like reading this letter, especially as it’s from a perspective of someone who knows. Yeah. Sadly there are many people who refuse to know, even within Ukraine itself. Just wanted to say I appreciated this. Daniel, we can always count on your clever commentary and bringing light to issues that need to be discussed. Thoroughly enjoyed it. Thanks sir. Hope the commentary doesn’t fall on deaf ears and we’ll see a peaceful resolution to things. Daniel, your posts are always so smart and well thought out. Thank you for starting important conversations and inspiring people to open their eyes (and their minds). “Carry on, Comrade”. . . . That’s the theme of the modern day Red Army. Their members are sort of a cross between Trotsky and Tim Gunn. Thanks for your comment, and I can only hope my words tip the scale for some people. Wow. Thank you for the perspective. It boggles the mind, really. Sadly, I fear too many will buy the propaganda. Hopefully rational minds will win out in the end. Superb writing! Thank you. And I can also only hope for the best. Right now I’m talking with my one friend in Russia. There is no military operation, there is nothing like what you wrote and your media says. You are spreading hate Daniel, like your ancestors did. Just america didn’t reach its goal so they decided to do something funny… hunh………. You are decidedly mistaken. I’m sorry to see you (and your Russian friend) are buying this. I would like to make it clear that as you “take care” of many countries then Comrade Putin has also right to take care of couple of countries. I’m not a Comrade Putin lover; but I must clear you that the person whom you are saying “dead” in above picture is not dead but lying down. Soldiers are firing in the air and he is doing what a good citizen should do. You say there are gays and their love is as ultimate as your mama/papa’s. We should respect them because you believe that they will be able to birth cute Daniels in coming years, right? I wish your papa could be a gay so you can see from sky and ask why you are not getting into life. It’s horrible, what’s happening in the Ukraine. And so scary. Your post is fabulous, I loved it! I just forwarded the link to one of my good friends here in NJ, who is also Ukrainian (most of her family is still there). Putin is nuts. We are all hoping that everything will end up ok (and not for Putin). Comment by Meki deleted. Everyone’s free to voice their opinions on this blog, but nobody will insult my readers and commenters. The main thing I am truly hoping for is that this ends peacefully and nobody has to shed blood because of political games. Wow! I really enjoyed your post. Thank you for not loosing the common sense and helping other people to restore it. I’m happy there are people like you who has poignant wit and can express the thoughts in such a clear and ironic manner. I hope there are many more of us than extremists on either side of this insane situation. I strongly believe that if sane and reasonable people speak up in all this, Ukraine has a chance to start on a new page. Let’s hope! What a great piece. I am an American (sigh) that spent a great deal of time in Ceausescu regime in that country and know full well what life was like during that sad time while under Russian control. My hopes and prayers are with the Ukraine. Thank you Kate for your kind words. I do hope things get resolved in a sane and peaceful manner. Yes it was as same horrible time as White House asked lavabit to turn its business down if…………..
🙂 Kate and Daniel you both got me very well 🙂 Cheers Social Animals! We are human beings who love opposite gender only. Do not make us social animals. thank you very much. I just came from Pamo’s site. Beautifully written and well said!! It is a terrible shame that you have to say it. It’s amazing the tyranny out there. I feel so bad for so many folks and what they have to endure. It must be painful for you to see in your country of origin, even from a distance. But your wit shows none of that. Government and individual alike should respect their fellow human beings. That should be the supreme rule. It shocks and saddens me to see how this propaganda is succeeding at turning people against each other and creating a “black/white,” “us vs. them” mentality. It’s escalated lately to the point where people, instead of focusing on rebuilding what is objectively a terribly unstable country (economically, politically, etc. ), are instead busy fighting against phantom menace that propaganda wants them to believe exists. I couldn’t agree more with you, and thank you! I enjoyed your humorous take on what is a potential threat to east-west stability. Let’s hope that Putin reads your letter and is able to grasp the underlying message. Glad you enjoyed it. I’m sure Putin has plenty of time to browse my blog, so it’ll be any minute now! Well written and wittily constructed. I hope this will increase awareness and counter this miss-information campaign being spread all around the media. The most important commodity that seems alarmingly scarce in our time and age seems to be “common sense”. I hope this does not become the rule. Let us stand our ground and try to shed some light on these terrible events so that they may be understood and seen for what they are: an outrageous attack on the sovereignty of another state under the pretext of (ironically) upholding human rights! Thankfully, with enough effort, most people nowadays can dig up the truth—we have more sources of free information available than ever before. I am a firm believer of common sense prevailing. Thanks for the comment. As scary as this situation is, for the world in general, but obviously more concretely and immediately so for the people living in Ukraine – I must applaud your very well written artistically satirical treatise on the very real yet sublimely absurd true motivations of Putin and the Russia that stands with him or idly by allowing him to get away with it. I can only hope that the people of Ukraine continue with the strength and restraint they’ve demonstrated thus far and somehow by luck or international support or coming to reason of Putin / Russia, or some combination thereof, make it through this largely unscathed. And truly it can only help that discussions occur such as this candid exposure of the audacious absurdity of Putin’s actions – be it through satire, other literary mechanisms or various forms of open dialog; that is much preferred to escalation and “resolution” through violence. Perhaps no amount of such social discourse can dissuade the intended actions of what is surely shaping up to be a madman; but then again the world has evolved considerably from times past when similar events occurred and things like social media and globally intertwined economics didn’t exist let alone matter significantly on the world stage. We can only hope and make our voices heard. Dominic, thank you for a thorough and well-put comment, and your kind thoughts. I am 100% with you and sincerely hope that the many voices of reason are heard. Well put, Sir, well put. Thank you. But will reason win? I hope so. It appears Putin needs you as his right-hand man. This is wonderful satire–I really enjoyed it. Brings to light the insanity of the situation, especially when penned by someone who’s from the country and is also a Russian speaker. Let’s hope this ends peacefully. The alternative is too unpleasant to fathom. By the way: “after all, you put out what you Putin”—loved that! Glad you enjoyed it, and I hope that rational people will win in all of this. I don’t think I can say it any better than Carrie. Great work man. Thanks. I just hope sanity prevails. I’ll be back later to fully digest this post. Wow Daniel- you are incredible! I hope to make a tiny bit of difference, at least. And thank you. You do make a difference. To read this from you, someone who understands personally what’s at stake, makes a meaningful impact. Satire, in this situation, is possibly the best way to point out the absurdity of these events. Thank God for the internet and people like you. Well done, Daniel. Well done. Thank you. This post has gone more viral than anything I’ve ever published. So even if I all I can make is these small ripples, I’m happy. Anyway- well done. What you write matters. I do hope your family and friends in Russia…uh Ukraine are safe or better at playing dead than that fella you outted (hope he isn’t a gay actor). Thanks, they’re fine for now. I can only hope that reason will prevail in all of this.